“My first drinking experience was when I was five but drinking did not cause a lot of problems for me until after I got married and went on birth control pills. I’ve learned since that they can affect alcohol tolerance, but I certainly wasn’t aware of it at that time. I continued drinking and, because I was also quite frugal, I ended up drinking spirits of peppermint mixed with rubbing alcohol. This turned out to be a near-lethal concoction that I did to get what I needed out of the alcohol as my alcohol tolerance increased. So, in my early twenties, I ended up in a hospital on March 7, 1971, with alcohol poisoning. I had passed out several times before this, but my doctors never asked anything about my drinking and, in fact, had diagnosed me with “somnambulism” (falling asleep at unusual times) and had prescribed Ritalin for it with other medications to help me sleep when I needed to. While on these, I ended up in the hospital with alcohol poisoning because I had passed out at the supermarket where I had gone to buy more spirits of peppermint and rubbing alcohol. After a day or two in the hospital, the head psychiatrist, a very prominent psychiatrist at a very prominent hospital, asked for a meeting with me and my family. He said it was obvious to him that I had a serious alcohol problem and that there were very few options for people with this kind of problem. He presented two potential solutions. 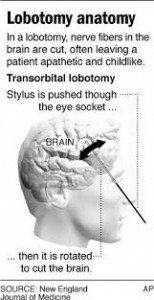 I could spend a minimum of one year in treatment at the Norristown State Hospital – a state psychiatric asylum, or I could save myself and my family a lot of difficulty and undergo a surgical procedure on my brain that would take away any compulsion I had to drink. He recommended the surgical procedure because he thought it would be more effective and that it could be scheduled far quicker than admission to the state hospital where waiting lists often delayed admission. My parents and my husband were a bit taken back with all of this, and my sister began researching these options. In the meantime, my minister saw my name on the hospital roster and why I was there – this was before HIPAA. There had been a recovery support meeting at our church that he used to visit and he asked one of the women from this group to come with him to visit me. She just came in and told me what her problem had been and what she had done about it. I had really tried to control my drinking myself but I had never been to any kind of support meeting. After hearing of the options I had been presented, she said, “Well, I can’t tell you what to do, but here’s what I did and here’s what worked for me and I’ve now had a wonderful life.” She told me her recovery story, so that’s what I chose to do, much to the chagrin of the psychiatrist. She became my sponsor and the rest, as they say, is history. 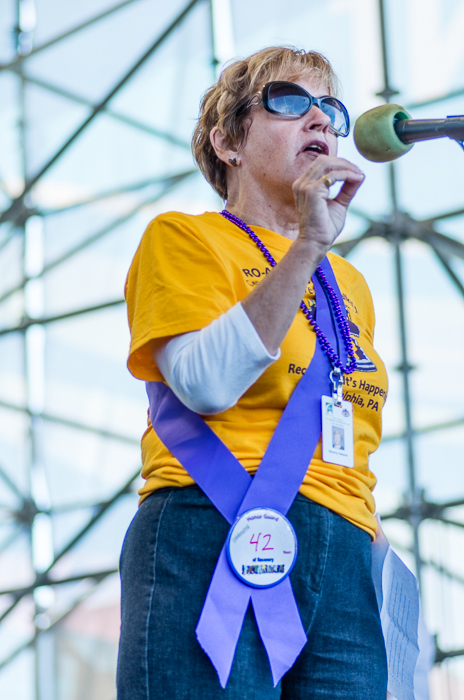 The woman at the center of this close call is none other than Beverly Haberle (left, speaking at the 2013 Philadelphia Recovery Walk), who went on to live a life of sustained recovery and service and to become one of the most effective administrators and recovery advocates in the U.S. Following her escape from psychosurgery, she volunteered for a church task force creating an addiction treatment resource guide. Through that project, she was introduced to the work of the Bucks County Council on Alcoholism, began volunteering there and went on to become the Volunteer Coordinator, the Program Director and then the Executive Director. The Bucks County Council grew under her leadership and subsequently changed its name to The Council of Southeast Pennsylvania, which includes the City of Philadelphia and the four surrounding counties. Beverly Haberle sits on numerous state and local boards, is the Project Director of PRO-ACT and is a member of the Board of Directors of Faces and Voices of Recovery. This wife, mother and grandmother received the 2013 Ford Hansel Lifetime Achievement Award.